Here's a happy duo that will make your day! If you have enough room behind your window valance or fascia, you can mount 2 of our radio controlled motors and choose the type of shade to suit the time of day. The picture at right is a very nice installation one of our customers did. Note how the first shade has a see-through quality, while the second shade makes it opaque. In this case, he used our standard (large) series because the tubing was big enough to accommodate the larger motors with a higher lift capacity. The 18 mm mini motors require about 1.25" (32 mm) of horizontal space (1" OD tubing + 1/4" roll wrap space), so you need less than 3 inches (76 mm) of frame depth to accommodate a dual roller system side by side. If you use the vertical offset roller arrangement, you can do it with a frame depth of approximately 2" (50 mm). This system makes it possible to deploy two different shade types, depending on conditions. 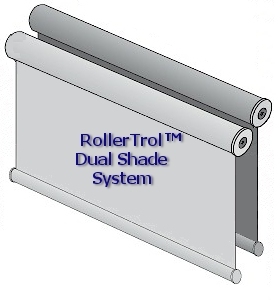 If it's bright outside and you still want to see out, you could use some tinted solar film on one of the rollers. If you have a home theater system and want blackout conditions, you could deploy opaque shade material. If blackout blinds aren't to your liking, but you like privacy, you could use some translucent shade material, or semi-silvered solar film. 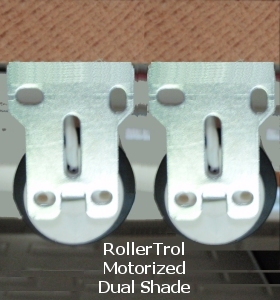 Our remote controlled tubular motors can be set for reverse operation so that you can organize the motorized shade roller positions however you like. The motors can be installed in either the left or the right side of the roller tube and each one can be programmed to go in the opposite direction when you hit the 'up' or 'down' switch on the remote. You could easily set up a multiple window configuration where all the shades of one kind would retract simultaneously (going up), and all the shades of another kind could be deployed simultaneously (going down). You would not have to wait until one type finished before you activate the other type; just a quick channel change on the multi-channel remote will do it. Some typical dual shade arrangements are shown above (left to right): dual shades side by side, dual shades with vertical offset, dual shades with vertical opposed rollers, triple horizontal (go crazy with three shades! ), 14 channel remote. 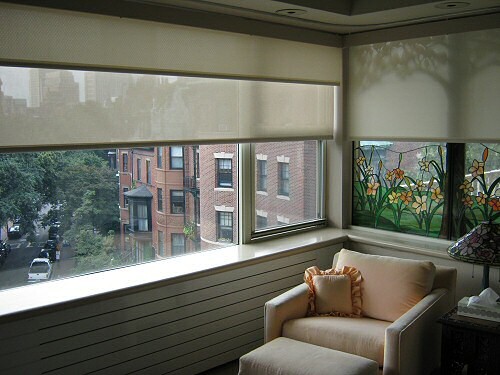 Each blind can be assigned to a different channel, and you can 'group' the shade operation - if you have, say, 3 different windows, the first blind in each window can be assigned to one group, and the second shade of each window can be assigned to a different group. 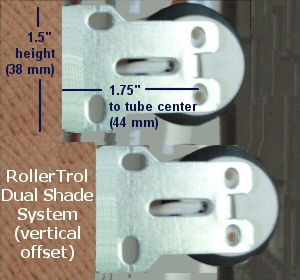 So if you had, for instance, some tinted solar film material on your roller in each of 3 adjacent windows, you could make all three shades of that type deploy at once, on a single channel. So channel 1 might be solar film, channel 2 might be a blackout shade, and chanel 3 might be a translucent shade (on 3 different windows). We have 1, 2, 5 and 15 channel remotes, so you can start small and expand your system later. You can change the material to suit your needs, and you can use double sided tape or duct tape with a few wraps on it to fasten new material to the roller. Please note that we also have very affordable wireless sun sensor (or day/night) triggers, and wireless programmable timers.